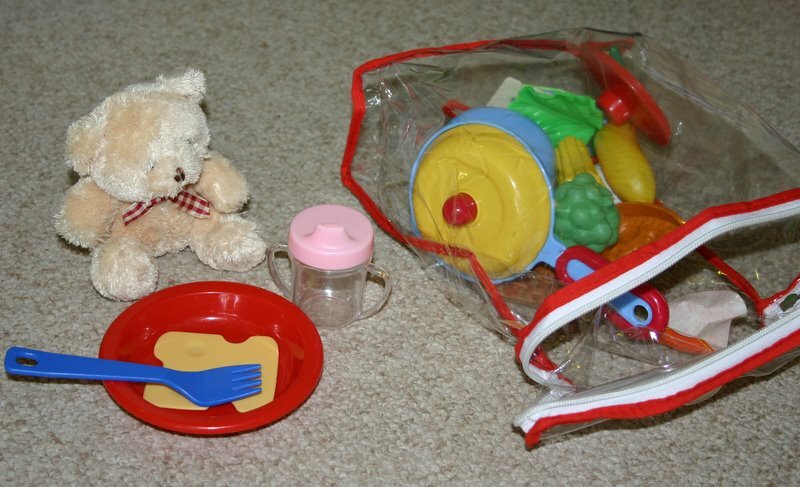 Teddies, cooking equipment and food are such an easy activity to put together for toddlers. 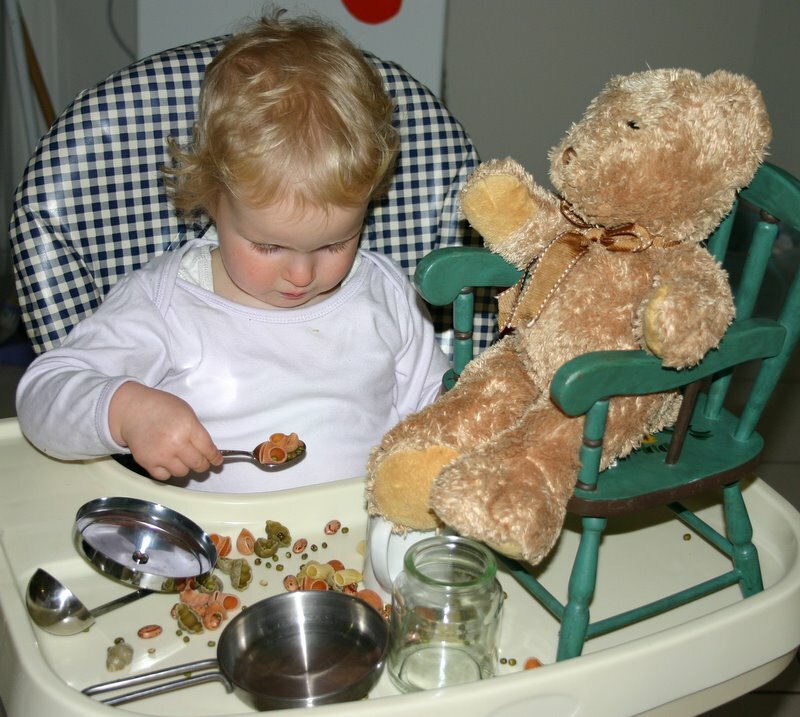 Little boys and girls love to pretend cook and feed their willing teddy companions. I use this kind of activity for highchair time, mat time, playpen time or as a table activity and it’s open-ended nature lends itself to long periods of concentration. It is easily updated and kept fresh by simply adding some different containers, cooking equipment, food or teddy. It can be a “new” activity every week without much work on your behalf. 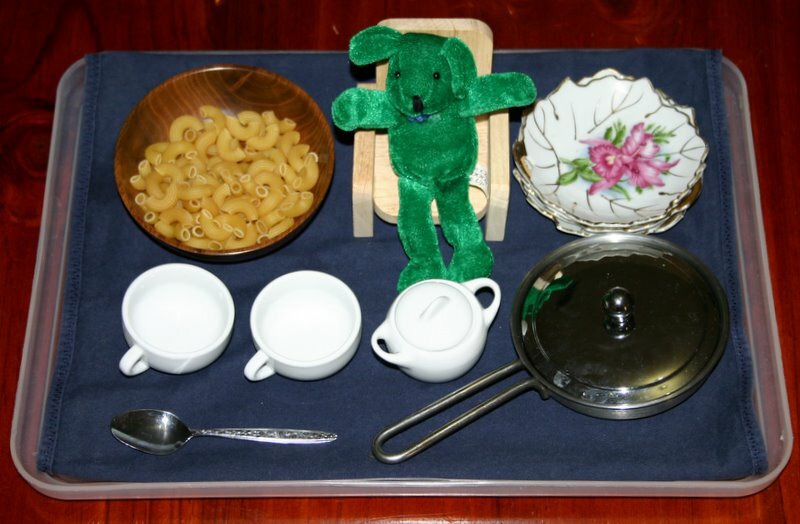 Simply look around the house, gather up some interesting containers, plates, cups, cutlery and the like, some kind of “food”, a teddy and you are set. Keep in mind the age of the child and choking hazards. Beans, pasta and jewels are best used under supervision or not at all if a child is very tempted to stick them in ears, noses and mouths or anywhere else they shouldn’t be! Sometimes I use doll-house sized teddies and doll-house furniture so the teddies can eat at the table, go to sleep in a little bed afterwards and even sit on the couch to relax. I have used plastic food, felt food, wooden food, dry pasta and beans, jewels and rocks and even pictures of food glued onto card from junk mail. As soon as your little one has begun use their imagination (pretend play) you can introduce this activity. For the very little children, you might even sit and play with it with them first, teaching by your example what to do with each item. Children with older siblings have had this modelled extensively, but a first child will not always know how to play unless you show them. They will of course work it out for themselves, but if you want a young child to use this kind of activity enthusiastically for an extended time, some modelling will go a long way to extending their play.